Want to see the latest goals from Paulo Dybala, Dries Mertens and Mauro Icardi? 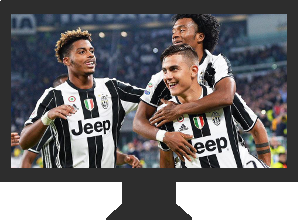 Well, there is an easy way to watch Juventus, Napoli, Inter and the rest of Serie A online. William Hill live streaming direct to your computer or mobile device allows you to follow what promises to be a thrilling season on the peninsula, with champions Juve vying for the Scudetto against free-flowing Napoli and rejuvenated Inter. The Old Lady have won the last six editions of Serie A but find their dominance challenged by a Napoli side described as one of the best in Europe by Pep Guardiola and famed for their wonderful football, while Luciano Spalletti has the Nerazzurri back on track and in contention for a first title since 2010. And with the likes of Milan, Roma and Sampdoria too, there are plenty of iconic clubs to keep an eye on. Can Leonardo Bonucci inspire the Rossoneri? How will Roma cope without Francesco Totti? And can Sampdoria qualify for the Champions League? Italy may have missed out on the World Cup but the country’s domestic football is in a healthy state and has some of the biggest names and best players anywhere in the world – so why not watch Serie A online? Signing up to William Hill couldn’t be simpler and once you’re signed-up and logged in, watching Serie A online is a straightforward process. Go to Williamhill.com and use the Join Now link, located in the top right of the page. Fill in the details – country of residence, Personal Information, Contact Information, Address, create a log-in and pick your security number, then confirm your preferences. After your William Hill account is created and verified, head to the live streaming page and once the pop-up window loads, you’re on your way to watching a whole range of sports online. William Hill also offers a schedule for what’s on and when, helping you find the Serie A fixture you’re looking for by picking the date and the event. To watch, you have to have a funded William Hill account and geographic restrictions may apply.